By trying to write as though the Holocaust were not the inevitable future of European Jews, Elukin aims to shift our attention away from lachrymose history to quotidian survival. In the early middle ages, at least, we shouldn’t confuse clerical antijudaism with general attitudes: how much power did Church councils really have, he asks, and what could an antisemitic king do when he could barely hold onto his (Visigothic) throne? Moreover, he argues, violence was not typical for Jews, or, at least, not particular for Jews: in polities without much in the way of infrastructure, standing armies, or police forces, in a public rhetorical tradition devoted not to calm description but to evaluation–praise and blame, violence was endemic. What the Jews suffered was not all that unusual. Violence should be understood as only occasionally afflicting the Jews, who, despite it all, almost always came back to the cities or regions that expelled or massacred them. Sometimes this took a generation, as in the Rhine valley following 1096; sometimes this took centuries, as in England following 1290. But it always happened. Elukin implies, in brief, that we should not believe we know better than the Jews: if they thought it was safe to move back, why shouldn’t we? Elukin’s evidence did shake some of my lachrymose expectations: Jews in early medieval Sicily established a shrine to Elijah on the model of a Christian saint’s shrine; Jews in Rheims offered to bring out their Torah to help break a drought; the Jews of eleventh- and twelfth-century Speyer had to take their turns guarding the town walls; English ‘ritual murder’ shrines were financially unsuccessful; interfaith marriages and Christian conversions to (what we now call) Judaism occurred…every so often. But a brief work that covers this much temporal and geographical territory (from 5th-century Minorca to 17th-century Germany) must necessarily skim (see for example Michael Toch’s review of Elukin in The Catholic Historical Review); its reception of Gregory of Tours and other historical narratives takes as straight fact what should be taken as discursive fact (and here Elukin could have looked to the model of Daniel Boyarin’s thinking with Marc Bloch and Foucault, either here or here or here or indeed here); its conception of two clear groups called “Jew” and “Christian” could have worked more with Ivan Marcus and Israel Yuvel. Ultimately, I’m unconvinced by the rosier picture Elukin promotes. Rhetoric against heretics or peasants or women could get nasty, yes, and violence against Jews should be understood within the larger context of a Christian and exploitative and masculinist society whose objective violence is all too clear to we paranoid modern critics. But surely the repeated massacres, judicial murders, and expulsions of Jews from the late eleventh century on, and the centrality of antijudaism to, say, the development of Mariolotry (warning: pdf) suggests that Jews were a special object of hatred for medieval Christians. We may be back where we started. Not quite, I hope: with Elukin in hand, we should read more carefully, read in the heterogeneous present of medieval Jews without having their future, our present, so clearly in mind. We read with a hope at once retroactive and future-oriented, knowing that what we think of as the past tied singly to the future could have gone another way and indeed went other ways in its own present, where we have York 1190 but also the York before that, where Jews made a community among Christians, where I imagine not every Jew and not every Christian was recognizable, primarily, as such. In a society in which Jews hired Christian nursemaids, we have to rethink the primacy of religious divisions. That said, that Jews returned to their various particular homelands–England, France, Germany–and that they therefore did not feel themselves to be in danger does not mean that they were not in danger. We can see patterns they couldn’t. Yes, Jews held on to Spain even after 1391; they moved back to the Rhine valley after 1096; they petitioned to return to England in 1320. These were mistakes. I think Elukin takes Jews as rational actors. But people aren’t rational, or not only rational. Or, better, home and habits have reasons of their own. A comparison, mutatis mutandis to avoid any sense that I’m blaming the Jews for what they suffered: in 2010, in this time of climate change, Americans continue hyperconsuming. There’s no indication that this will stop. This doesn’t mean I’m not in danger (nor does it mean, once more, that systemic antisemitism and antisemites are identical to climate). It just means that, like people generally, I’m insufficiently pessimistic, unable to do what I should to abandon my home, my habits, and therefore myself, though I need to if I’m ever going to escape this coming doom. 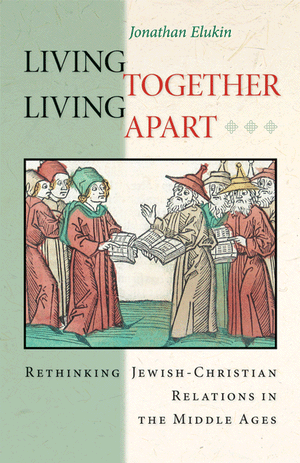 This entry was posted in Book Reviews, MedievalBlog and tagged historiography, Jews by medievalkarl. Bookmark the permalink.